Saturday morning, my mom invited me to go with her and my Granny to the Lost Pines Resort. Some of my Houston family was spending the weekend there as a getaway from all that Ike madness, and because these were the people who so wonderfully put us up during Katrina, this was a must for me. My Aunt Debby, cousin Adam, his wife Darcy, and 3 kids, Ashton, Alex, and Franny, are some of the MOST fun and awesome people you'll ever meet, so I was absolutely in. The resort is set in a really beautiful and woodsy area on the Colorado River, and we ate lunch on the little patio right outside their room. We headed to the pool, which has sort of a mini water park vibe to it with fake sandy beach, little water slide, and lazy river. Okay so, the whole idea of a lazy river is just sit in the inner tube and let the water just float you along all relaxing and lazy while the river does all the work right? Yeah, well apparently I can't do it right because my tube was just sort of spinning in circles in one place as my family drifted lazily along. Um, help? So after lots of paddling (Note: Paddling is NOT lazy), I catch up to them and all is good. Although, I should also mention that Darcy and I had just slathered on the sunscreen a few minutes before getting in the water. Unabsorbed suntan lotion + plastic inner tube + water = sliding through the middle of the tube with your feet and hands all stuck in the air. Okay, maybe it wasn't that dramatic, but it was close. This brings us back to lazy river...I wore the $10 turquoise suit. I've lost a lot of weight since the last time I wore it, so it fit even better than it used to. I was feeling pretty darn self-confident on this sunny day, and I admit I might have even been strutting some. Go me. Anyway, I'm floating next to awesome and adorable Darcy who's sporting her super cute yellow and brown print bikini, and I'm feeling pretty badass for hanging out with these cool people. Life is good. Well, along comes this woman who had to be at least 68, and guess what she's wearing. I'll give you a hint...it's turquoise. Sigh. I'm 2 for 2 so far. And apparently, I have the same taste in swimsuits as 75 year old women. After a few rounds of lazy floatation, Darcy, Franny, and I head to the bar for some curly fries and nachos. 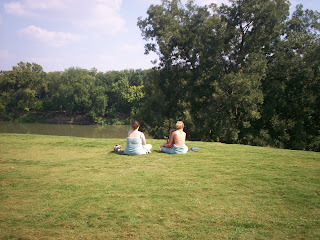 Darcy found this perfect grassy area overlooking the river (real, not lazy), and we had a little picnic enjoying the view. I have to say I think this was my favorite part of the day. It's days like these that make me realize how incredibly blessed I am to have these people in my life. Darcy and I are just getting to know each other and spending the day with her was so good for me. She's smart and funny and kind. Adam is so badass and such a nice guy. He's fun and seems to embrace life with such a positive energy. My Aunt Debby is beautiful and joyous and brings sunshine wherever she goes. Granny is unconditionally loving and my mom is my very best friend. The kids are so much fun to hang out with and talk to. How many people are lucky enough to have so many wonderful people in their life? And this is just a small part of my big, loving family. It can't get much better than this. Now, can somebody please take me swimsuit shopping? J-letto!!! So glad to see you on here. And I totally am getting the lotus. I am super jealous of your mini vacay, and will have to hate you at least part of the day. But I will take you swimsuit shopping. :D You crack me UP! Love you to a million tiny pieces! Can't wait to read more. wow, I'm glad I was there because if I hadn't been I'd be wishing I was. You can write yo.